Viewers of Michael Oswald’s seminal film on Britain’s tax haven empire have been bemused in recent days by a pop-up ad put out by Jersey Finance, the finance industry lobby in tax haven Jersey. 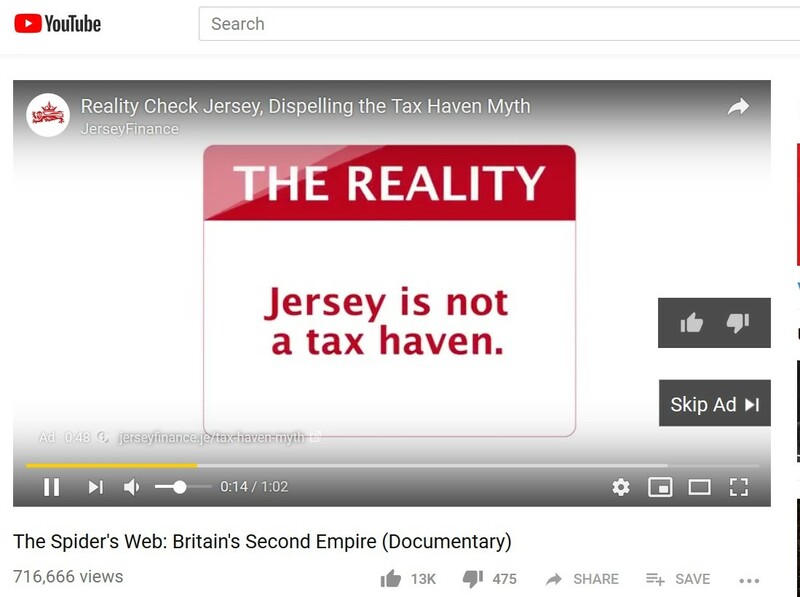 The ad, running under the title ‘Reality Check – Dispelling the Tax Haven Myth’, plays the usual tax haven trick of claiming that Jersey doesn’t tolerate tax evasion while ignoring concerns about tax avoidance and non-cooperation with anti-corruption transparency measures. Since uploading The Spider’s Web for free viewing last month, close to three quarters of a million viewers have accessed the English language version (and over ten thousand the French language version). Jersey Finance’s ad campaign appears to be a panic reaction to this huge success – although we doubt that tax haven claims to having given up on the bad old ways will convince many people viewing the film. Our most recent assessment of financial secrecy in Jersey placed the island’s offshore centre eighteenth in the global ranking, with a secrecy score of 65 (lower than the neighbour secrecy jurisdiction of Guernsey , but still well within the danger zone). Jersey, like its counterpart British Crown Dependencies and Overseas Territories, has refused to make details of offshore company beneficial ownership available on public registry; pure tax haven behaviour, though, strangely, not mentioned in the Jersey Finance ad. Needless to say, the issue of offshore trusts created in Jersey also go unmentioned in the ad, despite being discussed in the film. Did we mention that Jersey Finance is an industry lobby, which might explain why they are being so economical with the truth? In our 2018 report on tax haven Jersey, we noted the recent case before the Royal Court of Jersey against Sheikh Fahad Mohammed Al Sabah, the former head of the Kuwait Investment Authority in London, who defrauded a Spanish company of hundreds of millions of dollars. The Sheikh used a Jersey trust to block his creditors from reclaiming the proceeds of his fraud. In theory, it should be possible to penetrate Jersey’s asset protection trusts by someone who’s the victim of criminal activity by the settlor. Yet when the Spanish group, GT, tried to collect in Jersey on an $800 million judgment against Fahad, it was unsuccessful because the money was in the trust, and the Jersey court ruled in the Sheikh’s favour. Again, pure tax haven stuff (read more here). Jersey features heavily in Michael Oswald’s film, which includes a lengthy and disturbing interview with Stuart Syvret, a former Senator and health minister in Jersey’s government, who has faced extraordinary harassment and imprisonment for blowing the whistle on irregular practices. Watch the film and judge for yourself whether or not Jersey deserves its tax haven label (and don’t forget to ask friends and colleagues to also watch the film and form their own opinions). P.S. If you want to read more about how offshore finance has shaped Jersey’s society and culture, read this recent blog by a former Jersey resident, and also read Oliver Bullough’s Guardian Long Read on the island’s descent.